Sometimes when I have a weekday off to myself, I like to hop on a train and head outside of London. Very slowly, either solo or with my husband, I am trying to explore more of this country that we’ve called home for the last two years and will do so for the foreseeable future as well. 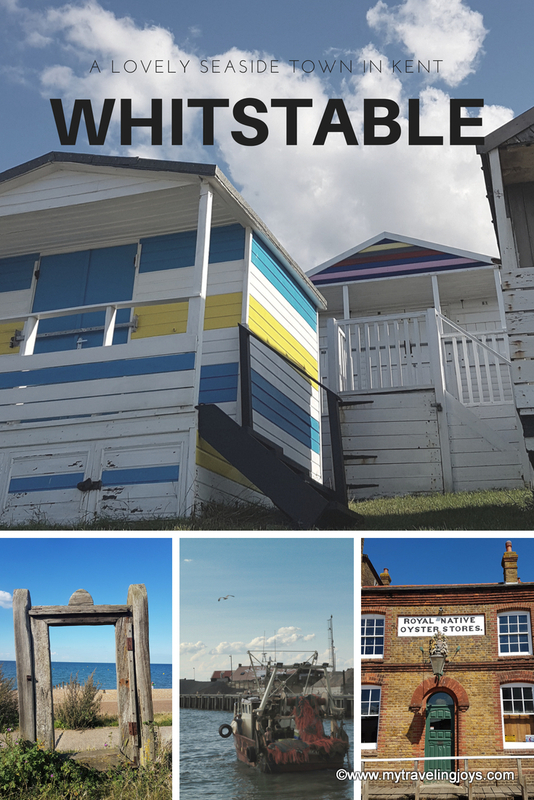 On one such occasion, I took a train from London Victoria to the seaside town of Whitstable, about 90 minutes away. This coastal town is the perfect summer day trip from London and a foodie destination too. Whitstable ticks all the boxes for me already. Taking a morning train means I need some caffeine as soon as I arrive into Whitstable. 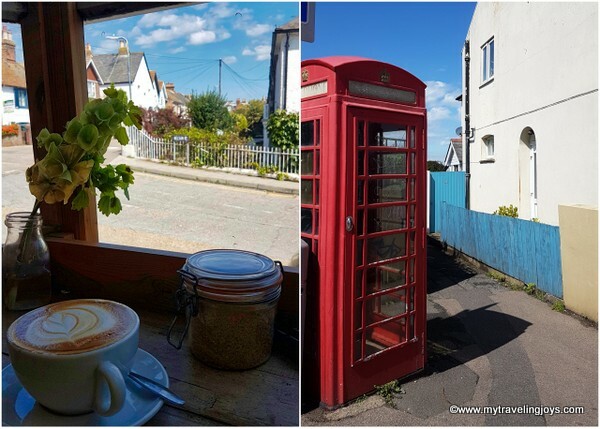 Located near the beach on the corner of Nelson Road and Island Wall, Windy Corner Stores & Café offers a good selection of homemade baked goods, lunches and a good flat white. Since the outdoor seats are already taken, I sit in the window seat and enjoy some people watching. 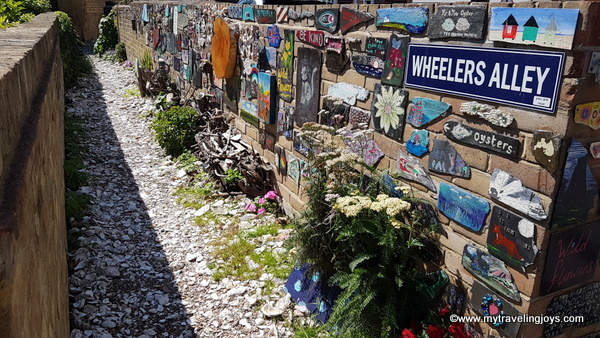 Being a seaside town, Whitstable seemed to have an artsy, relaxed vibe. 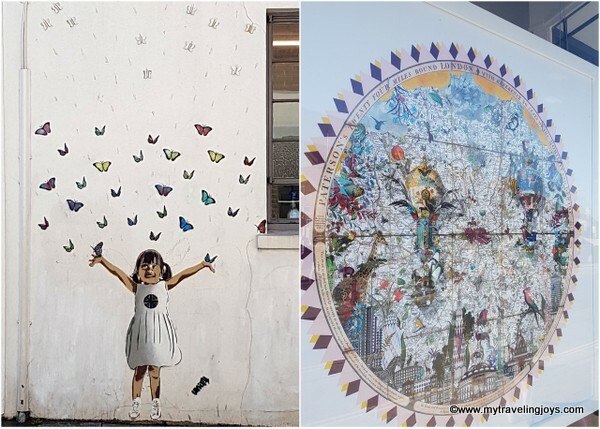 I found some interesting local art at the Fish Slab Gallery as well as some fantastic street art as I wandered around the narrow laneways. 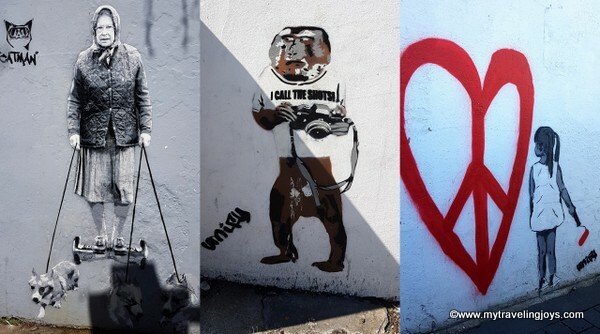 I discovered that several of the stencil art/paste up pieces were designed by Unify, a street artist known for his work around London as well. 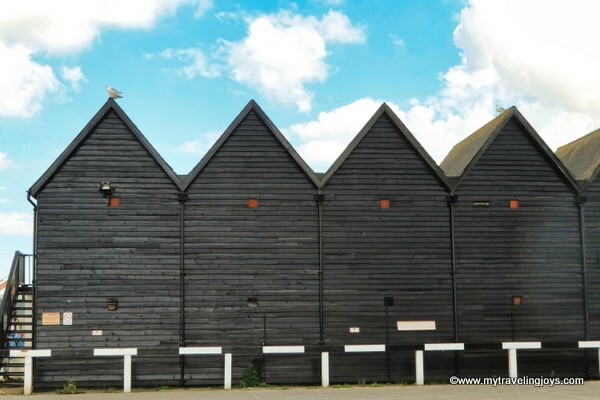 Being at the seaside means eating seafood in this coastal town in Kent, of course. 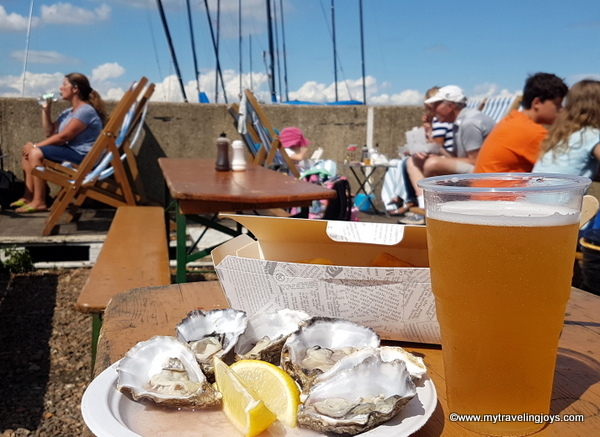 And Whitstable is known for its oysters and even hosts an oyster festival in July. 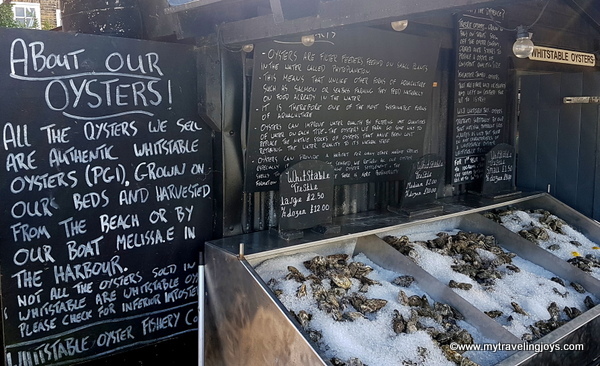 One of the popular places to sample some local oysters is at The Forge, which is located right along the beach. I don’t even like oysters, but I tried a couple of them and fed my leftover chips to the yapping seagulls. 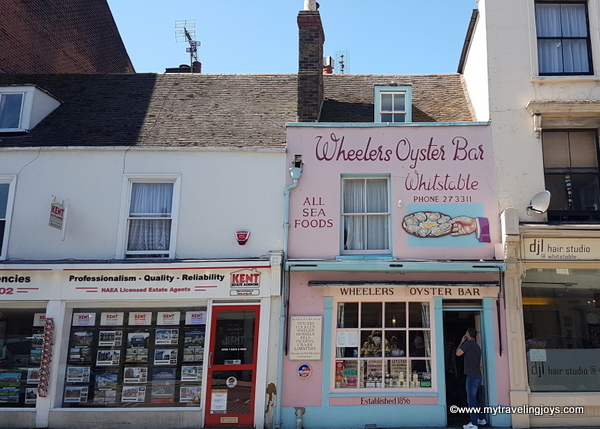 You’ll also find oysters at the popular Whitstable Oyster Company and the pink-hued Wheelers Oyster Bar. After lunch, I decided to take a stroll along the harbor and look for the colorful bathing boxes which I had read about online. However, I quickly learned, that the seashore was filled with rocks – quite uncomfortable for sunbathing – and so typical of U.K.’s beaches. But that doesn't stop kids from playing along the beach or wading into the sea. 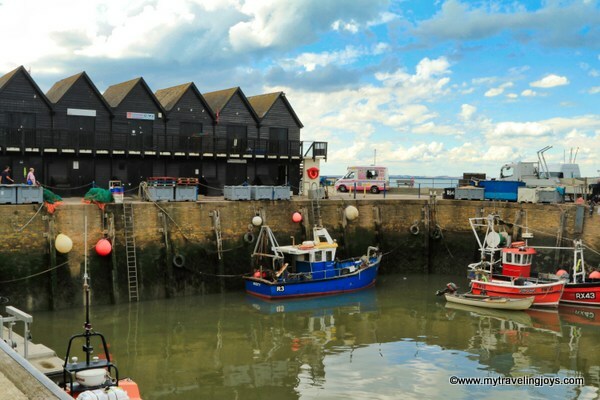 Along the harbour, you’ll also find the Harbour Market Whitstable which features about 35 traders selling everything from coffee and ice cream to handmade jewelry and artwork. Perched on the hillside, you’ll discover the Whitstable Castle, or the Tankerton Towers, as it was first called by the Pearson family who called the manor house home in the 1790s. The castle is open to the public and features a lovely, small flower garden and an afternoon tea at the café. In case you’d like to know, the castle has experienced an interesting history filled with mistresses, poverty, Rembrandt paintings and more. 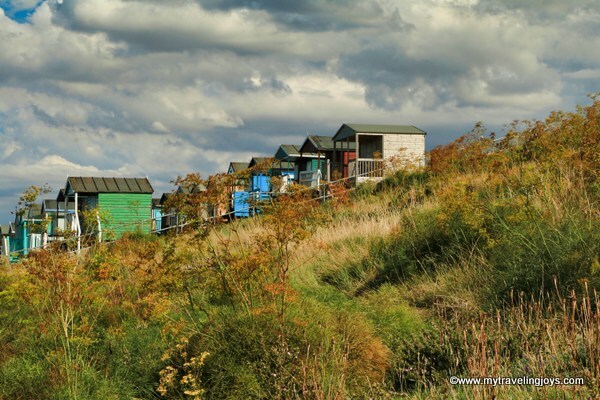 A bit along the coast, I find a plethora of the bathing boxes – each one different with its brightly colored stripes and décor. 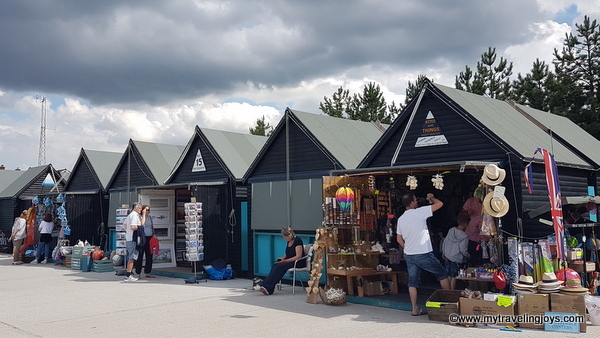 Surprisingly, these tiny beach huts sell for several thousand pounds, and there are constantly waiting lists to buy them too. 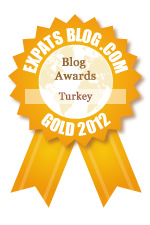 Expensive real estate, but cheaper than our London flat! At Tankerton Beach, I stumble upon a patch of hogs fennel, also known as sulphur weed, which I learn is one of Britain’s rarest plants and grows in few places, but seems to like the Whitstable coastline quite well. Who knew? 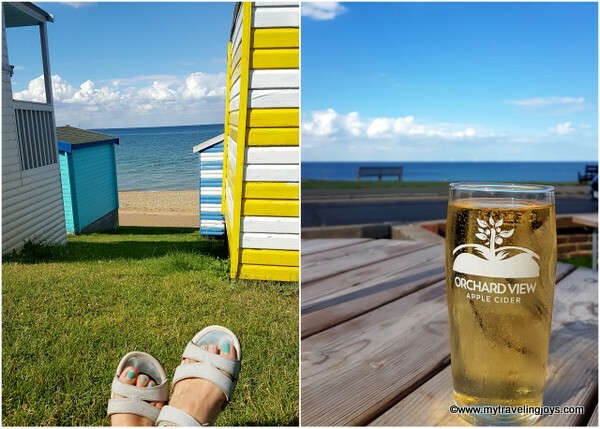 The hot sun made me thirsty so I ventured up the steep hillside and cooled off with a pint of British cider at the Royal Pub. After an afternoon in the sun, I headed back to the Whitstable train station, about 1.5 miles away, but first treated myself to a seafood risotto dinner at Samphire in the town center. 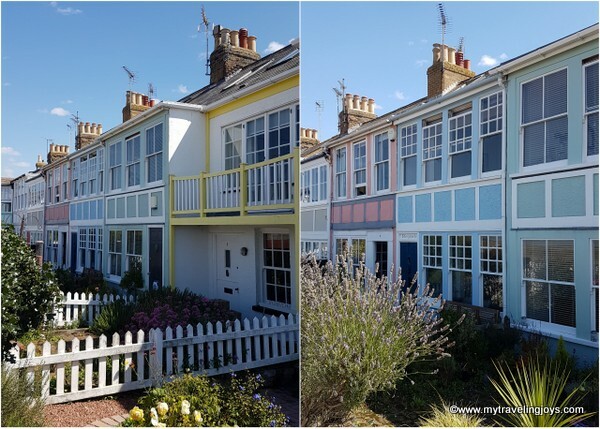 As you can see from my photos, Whitstable is a darling, pastel-hued town that is perfect for a summer break. 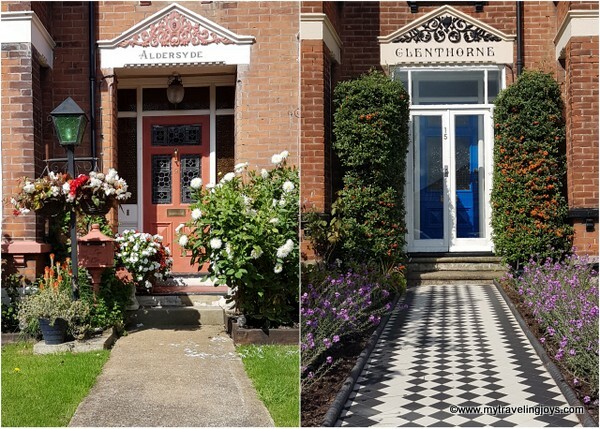 What is your favorite summer get away in the U.K.? 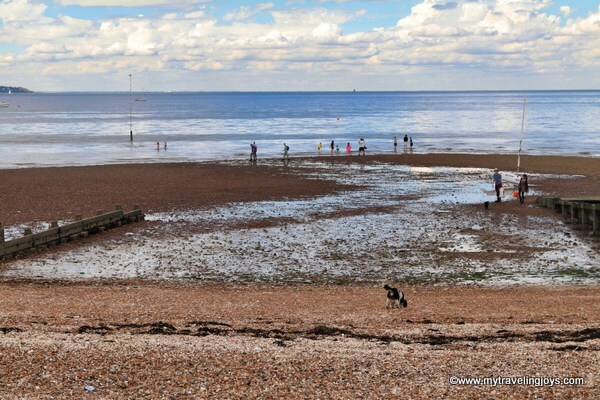 The North Kent coast is my old stomping ground - love the area! Used to keep my sailing cruiser at Iron Wharf Boatyard, Faversham, another historic old and interesting town.